A little fashion post for you all today and it focuses on that special day between two people in love. Last year, I attended not one, not two, not three, but four weddings, and they were all so lovely! However, the led up towards them four special days were anything but lovely. I, for one, love going shopping and finding a cute outfit, it makes me happy. But wedding guest outfit shopping is on another level. The stress of finding a suitable outfit, taking in consideration the time of year, what the weather might be like, is it comfy, where the hell am I going to find shoes comfortable to last me all day and all that fun stuff, it is hard to whittle it down to the perfect wedding outfit. This is where this post comes in. 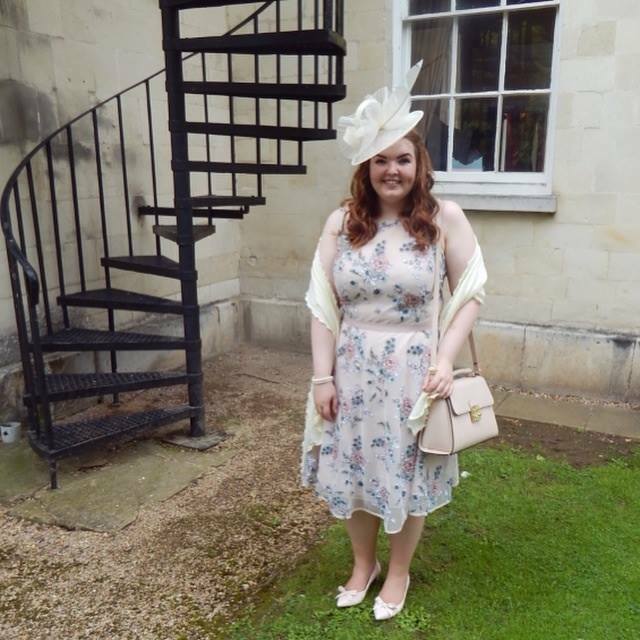 I will be showing you two wedding guest outfits I wore last year, one for Spring/Summer and the other for Autumn/Winter. The Black Tux, who cater for all colour schemes and styles with their suit and tuxedo rentals, have created a Wedding Guest Style tips guide that I have included in this post to make it a little easier for you too. With the Spring/Summer weather being unpredictable and with a wedding being a rather long day, you want to wear something that is comfy, light and that you can actually move in. For my cousin's wedding in July, I went for a pale pink colour as this is obviously just screams this season. I feel pale, pastel colours suit these seasons more than Autumn/Winter as they are soft, delicate and look very pretty whilst the sun is shining down. The style of dress I went for is this floaty, sleeveless dress as, with it being a warmish day, I wasn't going to be hot in my outfit, something I was worried about. When the day went on and the weather wasn't as sunny, I opted for a light scarf, instead of a jacket, as it was easy to carry and it didn't take away from the beauty of the dress, but enhanced the floral embellished detailing on it. During a Spring/Summer wedding, you need to take care whilst choosing an outfit as depending on the month, the weather can be all over the place, and you need to find an outfit that you feel comfy in for the long day. 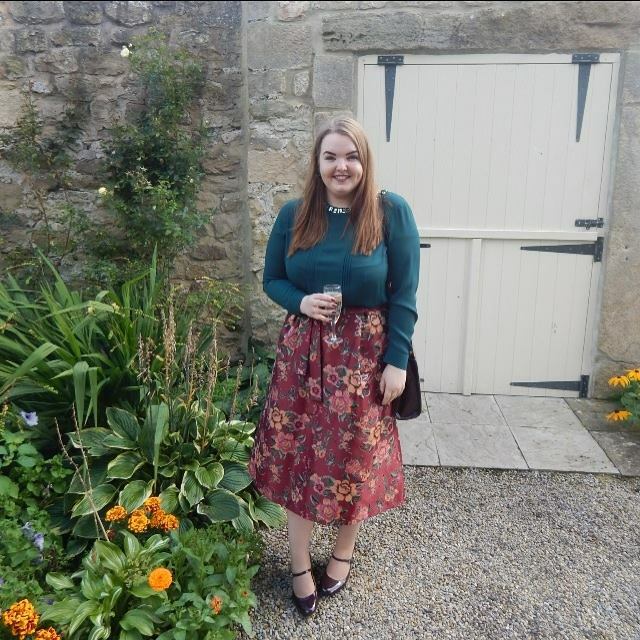 For a wedding in the Autumn/Winter months, I opted for a skirt/blouse combo instead of a dress. If you are a wedding guest during this time of year, I feel a more bold, dark colour scheme works sooooo much better than a pastel one. Like the colour combo of deep red and bottle green I went with, it goes with the colours of nature during this time. Burnt oranges, dark purples and pinks, and deep blues were also on my colour outfit list, but I fell in love with this bottle green and dark red outfit. You cant really go wrong to be fair! Even though I finally went with a skirt and blouse outfit, wearing a jumpsuit was a close second. With the weather changing from [hopefully] sunny days to cold, dark ones, it's most likely gonna be a windy wedding day and instead of holding a floaty dress/skirt down for the duration of the wedding, you wouldn't even have to worry about that with a jumpsuit. Ah the beauty that is a jumpsuit, hey! And there we go, roll on the two weddings I have this year as my outfits are all sorted now!